A 500-mile journey from Birmingham to Cincinnati saves Boxer from fatal brain tumor. Cincinnati, OH — December 21, 2015 — What is the connection between a family in Birmingham, Alabama and a veterinary cancer care team in Cincinnati, Ohio, over 500 miles away? 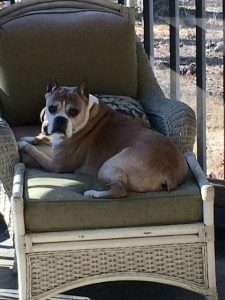 Addy, an 11-year-old Boxer diagnosed with a life-threatening brain tumor, and a dedicated pet owner on a mission to save her furry family member. 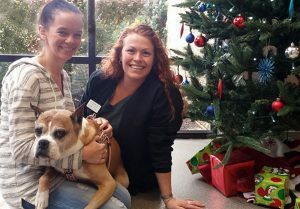 With the help of PetCure Oncology at Care Center, pet owner Laura Leal and her beloved Addy will be able to enjoy some extra cheer this holiday season. Laura and Addy have been an inseparable pair for more than a decade. Laura, a registered nurse, credits her medical training in keeping Addy healthy over the years. This past September, Addy began having seizures. With support and guidance from their Birmingham-based primary-care veterinarian, Addy was referred to a veterinary specialist and a CT scan was performed. She was diagnosed with a brain tumor and given weeks or maybe months to live if nothing was done. The recommended treatment was surgery to remove as much of the tumor as possible followed by 30 days of standard radiation therapy (RT). Laura understood the ramifications of the diagnosis but was uncomfortable with the recommendation. Hoping to avoid the lengthy treatment program and undesirable side effects that accompany standard radiation therapy, she wondered if there might be an alternate course of action. Laura found hope in an emerging new cancer treatment called stereotactic radiosurgery (SRS). She was pointed in the right direction by a friend who had recently attended a lecture that mentioned a study being done on dogs with brain tumors. With that in mind, she began to research the topic online and came across Dr. Neal Mauldin, DVM, DACVIM (Internal Medicine and Oncology), DACVR (RO), a leading expert in veterinary SRS and the Chief Medical Officer at PetCure Oncology. offering a treatment with the intent to cure cancer rather than just ease symptoms. minimizing both the risks and side effects commonly associated with RT. delivering high doses of radiation with sub-millimeter precision in a non-invasive, non-surgical manner. requiring only 1- 3 treatment sessions as opposed to 15-30. In late November, Laura, her father Joe, and Addy made the 8-hour drive from Birmingham to PetCure Oncology at Care Center, located at 6995 East Kemper Road in Cincinnati. Addy began her SRS treatment on a Wednesday morning and by Thursday afternoon – after just two treatment sessions – they were on the road home. PetCure Oncology is revolutionizing cancer care for pets by establishing a network of centers specializing in veterinary SRS across the country. Centers in Phoenix, Cincinnati, and Clifton, NJ are operational. Locations in Wisconsin and Illinois are slated to open in 2016, with many more centers in various stages of development. To learn more or obtain a referral, visit PetCureOncology.com or call 773.850.3400.